If you wish to live the best life, then you need to learn to do the one next right thing now. Not tomorrow’s thing, not today’s list. Just do the one next right thing. Perhaps a lifestyle of doing the one next right thing is the closest you can come to living in faith. Such a way of life is not so concerned about tomorrow that it paralyzes you today. Sometimes we get so caught up in big dreams of our future that they end up discouraging us from taking action today. I tell people to dream. Even to dream big. But we cannot live in our dreams. That is losing touch with our reality. We just need the dreams so we can see the direction we are heading, and to see the possibility of what life can be. But if we hang out in our dreams too much, we may loose touch with reality and come back to earth with such a thud that all we remember is how long the drop is from where we wish to be to where we currently are. And then we loose the courage to go after our dreams, because the journey there seems soooo long. If we can learn to live in the world of doing the one next right thing now, our dreams can help us determine that next right thing. Then our dreams are a gift of clarity. Achieving our dreams though, that happens in a very real world, where there is work to be done. A lot of work. Hard work. The only thing that matters though, is the one next right thing. 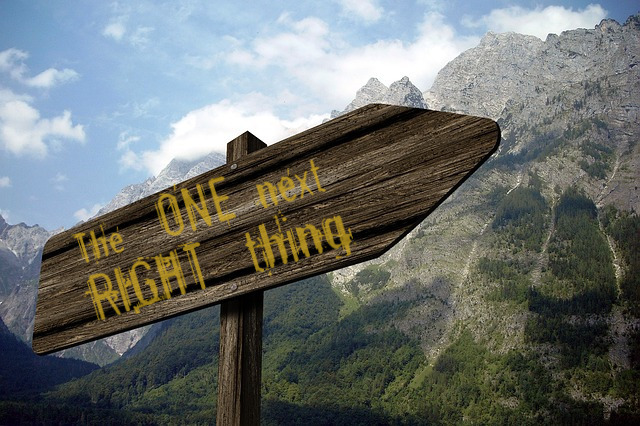 Doing the one next right thing is about being fully present in the right-now with an awareness of where we are going. It is about buying out this moment we have been given. Carpe Diem. It is about realizing that there is always something we can do now, that will move us forward to where we are going. It is about having faith. About determining that one next right thing you need to do, and then believing that doing so matters even if the action seems small in the scope of achieving your dream. It is about being faithful with the small scope of rule you’ve been given today, so you may reign a kingdom tomorrow. To consistently do the one next right thing now is an exercise in character. It takes patience and perseverance. It takes being willing to invest time, energy and money today, for the hope of a harvest in the future. To delay the gratification of what you could have now, so you may grow your reward for later. And it is a miracle in the making. It is always amazing what we are capable of accomplishing when we consistently take small steps in the right direction. Do you know where you are going? What is the one next right thing you can do now to move you along? Milton Friesen is a certified Life & Leadership Coach, and Entreprenuer, and blogs about success, positive psychology, spirituality, leadership, team synergy, and living the best life.